The Book-a-Week series has been created to help early readers, as well as children with reading difficulties, learn to read and experience success at reading. 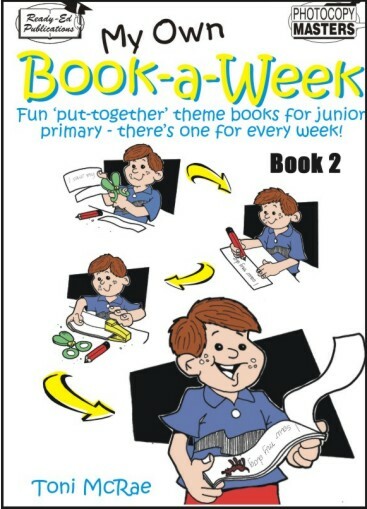 The Book-a-Week series contain ‘strip books’ which are easy to construct using minimal equipment and contain simple text and themes with excellent illustrations. In addition, the ‘strip books’ introduce and reinforce sight words; use repetitive strategies; contain early reading concepts and consolidate skills such as basic sentence structure as well as concepts of print, directionality and spacing of words. As a follow up to each ‘strip book’, there is an optional activity sheet that can be used to consolidate the comprehension and understanding of each of the books. Book-a-Week Bk 2 (NZ Version) 831807 14.95 readyebooks Fresh Download Available!